Altruism: this is why we are here. The concern for the welfare for others: this is why we are here. The belief that we can and will be better, that we can push harder, that we will save lives. The idea that a loved one will spend another birthday another holiday, another day, with those that they love. We, often at great risk to ourselves, dedicate our practice, our lives and our hearts to this cause; that we might be the light in someone’s darkest hour. The late Dr. John Hinds told each of his severely injured trauma patients, “I will not leave you.” What he was promising them was not simply companionship, a hand to hold or an experienced paramedic, he was promising them his own, personal, clinical skill and excellence as a trauma physician, who would remain with them in their time of need and transfer to definitive trauma care. It is with that approach in mind that Dr Hinds advocated for the development of a robust trauma system in Northern Ireland to include a helicopter staffed by a crew who could deliver similar skills and excellence. His belief was that the standard of trauma care the people of Northern Ireland deserved was only the highest. There is growing concern, after remarks made by the Minister of Health, Mrs. Michelle O’Neill MLA, that the physician led staffing model originally proposed and publicly supported, will not be the initial staffing model. The global Helicopter Emergency Medical Service (HEMS) community, has a wealth of experience in the delivery of advanced critical care and they know what works and what doesn’t. Dr John Hinds knew this too 1 and he worked with that community to advise and inform the way forward for a gold standard service based on the physician-paramedic staffing model. The leaders and clinicians from the best HEMS services around the world work together in research, best practice and knowledge sharing in this way. This community works together sharing best practice, knowledge and research to improve patient care and they were prime instigators with Dr Hinds in lobbying for the establishment of HEMS in Northern Ireland. “Recently, the UK National Institute for Health and Care Excellence (NICE), published benchmark guidelines. The life and limb-saving prehospital interventions listed in this guideline cannot be provided in Northern Ireland outside of a physician-staffed model. Examples include, but are not limited to: prehospital blood transfusion to a bleeding patient, safe general anaesthetic in severe head injury and advanced trauma resuscitation including surgical interventions. We fear the Service will not be capable of providing the best life-saving care possible to the people of Northern Ireland from the outset if a doctor is not on board the helicopter. Placing a combative, agitated, head injured or bleeding patient in a helicopter without a general anaesthetic is unsafe, both to the patient and the crew. You can read an edited version of the original letter by clicking here. Same high anaesthetic standards in N. Ireland hospitals as rest of U.K. The model proposed by the Minister of Health, would not be able to deliver what John and experts in prehospital care envisaged and this would be unfair to the people of Northern Ireland. Irish HEMS trained physicians and paramedics are in place and ready to serve together. The international HEMS community is prepared to support the paramedic-physician model and the world is watching. We sincerely hope that the Minister of Health hears the expert testimony of HEMS leaders and does not allow anything less than a physician-paramedic model. This excellence in trauma care is what Dr Hinds promised his patients and wanted for his community. This world-class HEMS program is what the citizens of Northern Ireland deserve. Please tweet, email and share this as widely as you can. If you have friends and family in Northern Ireland get them to read and share locally. Do what you can to give the people of Northern Ireland the trauma and critical care service they deserve. John Hinds on BBC. BBC. http://www.bbc.co.uk/news/uk-northern-ireland-33137007. Published 2015. Accessed December 9, 2016. What are your thoughts on the paramedic-only prehospital service provided in Victoria, Australia? Unable to comment as ‘paramedic’ is not a universally agreed definition or defined skill set. One might argue that this is not really about tribes, but rather skills sets and experience. In the UK model the paramedic skill set is not the same as the physician skill set and so there is a difference. For example paramedics are not routinely trained in prehospital RSI which may be considered a key skill for an enhanced pre-hospital care service. The consideration in this blog post is based on the customs, traditions and skill sets of UK trained staff. Simon, I find myself CONSTANTLY having to make this point- that all “paramedics” are not the same. Even in the US, where many paramedics have passed the identical National Registry exam, regional culture, educational focus, and work environment differences mean that their competency varies quite a bit. For example, Victoria’s MICA paramedics have a pretty sterling reputation. New Jersey’s (advanced care) paramedics are all hospital-based, always work in pairs, all have a dedicated full-time QA person, and are almost all in rapid response vehicles to ensure maximum clinical exposure (because low acuity patients get released to EMTs for transport). The question is what level of judgment is required for complex cases? I think there is a reasonable subset of cases for HEMS (and interfacility transfers to specialty centers) that would benefit from a physician level of judgment. The key is to be able to discriminate in the dispatch phase how to allocate that scarce resource and to determine if you need to designate specialty crews (pediatrics, neurology, burns, etc) or if a single physician specialty (emergency medicine, anesthesia) can provide the necessary level of judgment? I support the development of a physician delivered HEMS system in Northern Ireland. However, there are many ways that the public money we are talking about could be more efficaciously invested in the chronically, disgracefully underfunded urgent care system in the Northern Ireland NHS than this. Visit any ED in Northern Ireland and this will be demonstrated. HEMS in NI should form part of a complete revolution in health and social care in the devolved system headed by Mrs O’Neill – this will require real investment and redistribution of monies from the finance department and there will be stakeholders that lose out. This will require further centralisation of acute services in Northern Ireland. This will mean acute services will need to close. We know that 11 Emergency Departments serving a population of 1.8 million people has not been sustainable for many years but closing any service is a vote loser. Hence inaction and a refusal to deal with the reality of a socialised healthcare system. I understand that this will be an unpopular view and not in line with the thinking of the majority of the HEMS and FOAMEd community. HEMS docs and paramedics are amazing people and hugely skilled and committed in their provision of outstanding critical care in the community to the severely injured and ill. HEMS gives these people their lives back and enable them to contribute to their families, the community and the population as a whole. I understand that I may well get flamed for contributing a contrary view from the mainstream. I am not a supporter or opponent of the health minister for NI and have no axe to grind with anyone in the NI NHS. However, when faced with a choice between outstanding care for a few versus improved care for all and understanding that the realpolitik means you may not be able to have both, I know where my views will lie. There is no point having outstanding critical care at the roadside to be let down when secondary care does not have the resources to maintain that excellence. Have physician/paramedic HEMS by all means but as a part of an outstanding system, not as a shining light in the darkness. David, I think you present a very cogent and clear opinion and I completely understand your point of view. I think we need to be clear though. If the system waits to sort of the chronic issues such as access block and elective surgical waiting lists prior to sorting out acute care, then it will never happen. They need to happen side by side. The experience in England with the development of a robust trauma system has lead to a 63% decrease in mortality in 8 years. And trauma is the biggest killer under 40. The expenditure of a high class HEMS embedded within a trauma system will save lives, increase QALS in survivors and save money. In terms of the evolution of a prehospital retrieval service, would it make more sense to start with a road ambulance and doctor/ paramedic crew? Most of the Northern Irish population live within a 30 minute drive of Belfast, so demographically it would seem to make sense. A road model would allow the teams to make mistakes and get up to speed with SOPs without the added complexity, media attention and expense of a helicopter. After a year or two they would have a wealth of data as well as front page news stories to draw on in order to ensure that the get the helicopter retrieval service that they want. If they start with a paramedic-only service and it is seen to work, it’s difficult to see physicians being incorporated further down the line. David, I’d hope no one bullies nor “flames” your comment/opinion as it is given in genuine interest of improving health care in NI. John and I disagreed on several things. Infamously cricoid pressure but we could shake hands and agree to disagree in good humour. ON issue of HEMS for NI he had a singular vision and I respect that, coming from Australia where we have had prehospital physicians for over 80 yrs but also have critical care paramedic led HEMS like in Victoria as pointed out above. I dont believe John ever intended for this campaign to become divisive professionally. He worked with paramedics, GPs etc in his race medical crews . Of course a paramedic led HEMS is one option and obviously exists across the world in places like Australia , USA and Canada. But to be respectful to John’s vision, he believed a specialist prehospital physician and paramedic crew model was the best . I cannot speak for Northern Ireland as I have never set foot there so I place my trust in John’s vision, as he lived and worked there in prehospital and hospital medicine. I am happy to see that at least the plan to setup NI HEMS has crystallised and is likely to begin in 2017. As for the wider medicopoliticoeconomic issues of NI health care, this is an eternal struggle that we all face. Spending and distribution to cover as best as possible. Australia is not immune as we see inequities in rural vs urban heath care and access. In my opinion this is why a prehospital service is even more important. To address these issues of access inequality. I have minimal (i.e. no) knowledge of NI ambulance services, so I’m happy to agree with John’s view that a Dr/Paramedic model is best for them. However, I think using words such as “inferior”, “substandard”, and suggesting a paramedic-led Hems team is “unfair to the people of Northern Ireland” seems a bit heavy-handed, and will only serve to be divisive and taken as ‘paramedic bashing’. If I were one of the paramedics to staff the Hems service, I would find it hard not to be offended. I’m sure it was not the intention. It’s worth downloading the open letter and reading that which clearly supports the role of the paramedic (as does everyone at St.Emlyn’s btw). Ashley is not a doctor and clearly recognises the need for a team approach. The proposed model that has been withdrawn was for a paramedic/doctor combo. John Hinds was a huge advocate of a doctor/paramedic combo and so are we. Nobody is bashing anybody or any profession. We do recognise that in the UK there is a different skill set between the professions and that patients will benefit from both coming together. Although not stated in the post a doctor/doctor combo would also fail to recognise the contribution of both and again would not fit with the vision for a gold standard service. Whenever tribes and their skill sets are mentioned in social media there will always be those that take offence or read more into the words than were intended by the author. Anaesthesia or EM for ED RSI for example…….cue tweets ad nauseum! On this post it’s pretty clear to me that the best model is para/doc. We think that because they have different, but equally important skill sets in the UK training, accreditation, legal and supervisory systems. 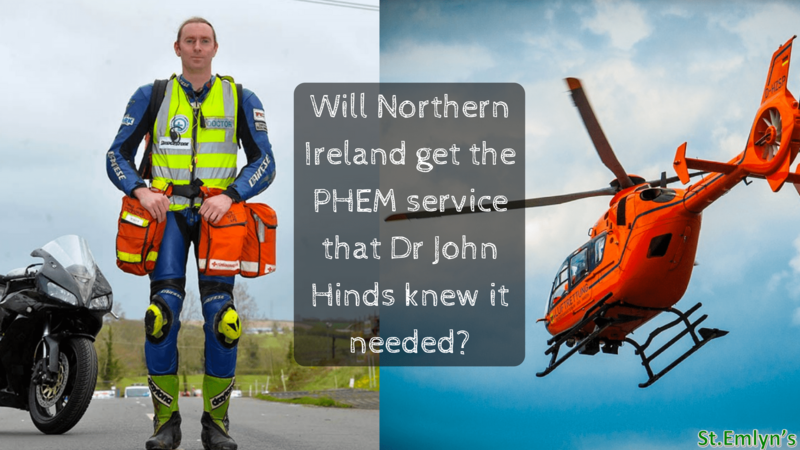 The bottom line is that we are supporting John Hinds vision for a NI HEMS. If anyone thinks they know more about it than he did then I’m pretty sure they are just plain wrong. I note that in your first sentence you agree with this, and that’s a good place to be. Hi Andrew,the letter needs to be taken in specific context and entirety and whilst I see how you may take offence to those quotes, I can assure you no offence is intended.